Underground stone mines in the United States use the room-and-pillar method of mining in generally flat-lying bedded formations. Pillar and roof span stability are two essential prerequisites for safe working conditions in room-and-pillar mines. Unstable pillars can result in rock sloughing from the pillar and can lead to the collapse of the roof if one or more pillars should fail. In addition, the roof span between pillars must be stable to provide safe access to the working areas. Falls of ground from the roof and pillar ribs account for about 15% of all lost working days in underground stone mines [MSHA 2009]. In the past, pillar and roof span dimensions were largely based on experience at nearby mines, developed through trial and error or designed on a case-by-case basis by rock engineering specialists. 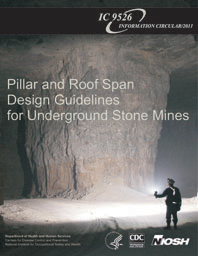 This document presents the results of research conducted by the National Institute for Occupational Safety and Health (NIOSH) in cooperation with participating underground stone mines to develop generally applicable guidelines for designing stable pillars and roof spans in stone mines.